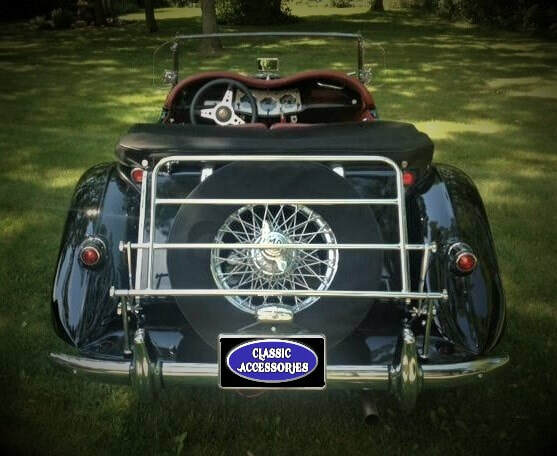 The Folding luggage rack is a replica of 1950s low level style racks that were designed to pivot down when used in service. Suitable for the MG TD and MG TF series cars and similar vehicles with horizontal rear valence panels, from the 1950s era. Polished chrome finish (to B.S .quality) with all fittings made from mirror polished stainless steel. Generous 29" by 16" loading platform area. Traditional hand brazed construction throughout for a seamless appearance and superior joint strength. Due to low demand this luggage rack is now made to special order only. The price is $379 USD plus shipping.